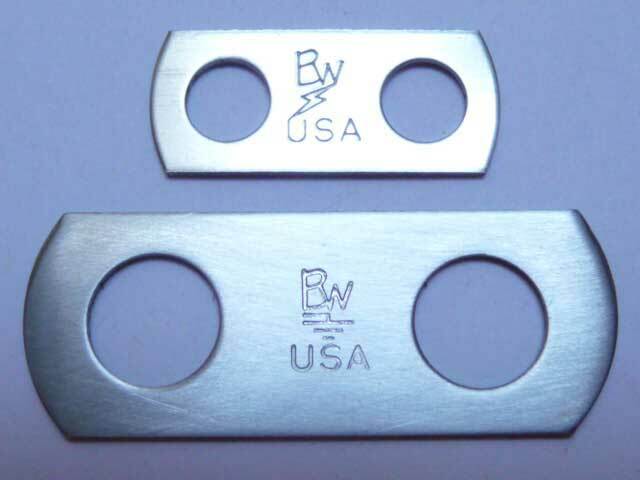 We at Ingenuity Industries Inc. hope you will consider specifying our BWUSA® Bondwasher® on all your ground bar sets. The following issues can and will be eliminated when you do. If you or your sub contractors are using large flat washers, you may be grinding flats on the sides in order to fit two lugs side-by-side on the bar. If that grinding wheel you used was used previously to grind copper, steel, iron, and/or aluminum, the particles of material from those earlier grindings now have been embedded into the sides of your flat washers to form contaminating particles, degrading your carefully-installed bond installation. If you use the large washers without grinding flats, you are either stacking washers on adjacent washers or lugs, or you are wasting ground bar space by skipping holes. If you use washers that are smaller in diameter to avoid stacking, are they smaller than the split washer? If so, you are not getting the full compression of the split washer against the flat washer! If you use no flat washers, the split washer can fall into the loose or slotted hole of the ground lug! This can loosen over time with expansion, contraction and can lead to hardware loosening. 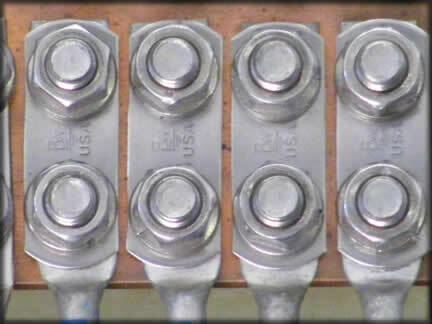 Some providers require a flat washer under the head of the bolt as well as under every split washer. Proper installation procedure dictates that you never place just a split washer under the nut. The reason? Ground lugs that have elongated or over-sized holes will allow the split portion of the lock washer to fall into the slot, thereby resulting in a weaker joint, mechanically as well as electrically. In spite of all the admonitions, guidelines, and suggestions, we still see installations in the field that have stacked washers, missing flat washers, split washers that are falling into the slot of the ground lug. We also see washers that are not American-made, and are of questionable material composition. The first picture below shows our two hole lug washers, which install with no issues and maximize the lug surface area with out ever overlapping. This picture above is our two hole lug washers, which install with no issues. Comparing the size of the 3/8 inch ground-lug and the 1/4 inch power-lug washers. Our washers have been approved by AT&T and Ericsson. They are becoming specified hardware in network build-outs. Fill the bar completely and cleanly! Use half the number of WASHERS. Finished in half the time. 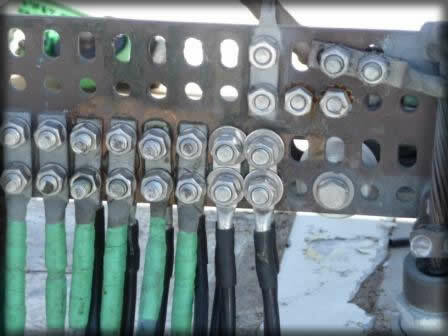 It's sometimes hard to believe that these connection points are the most critical connections in the event of a lightning strike. Many of them have been in service for twenty or more years and are failing. While looking at bars like this, it begs the question. Can these connections be trusted to protect from critical equipment damage or failure? get grounded and stay grounded! 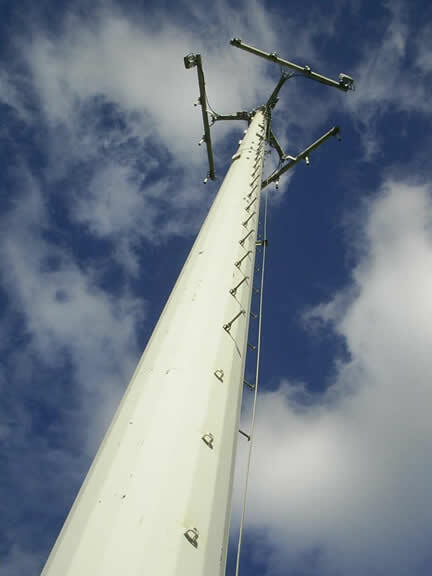 In the past couple of years with the Carriers upgrading their networks, we’ve seen additional runs being installed on cell sites. 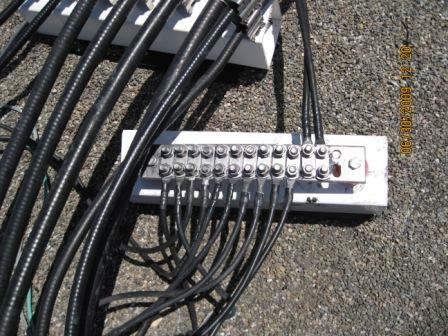 We at TCI have gone back and forth with the numerous Carriers regarding grounding on cell sites, especially regarding the flat washers overlapping each other on buss bars. To please the Carriers, we’ve spaced the lugs to avoid overlapping. We also special ordered smaller OD washers at higher costs to make them fit on the bars. At times, we had to order larger buss bars to accommodate for all the additional ground lugs. This was costing us time and money to resolve this issue. The two-hole Bondwasher® solved this issue on our very first installation. The washers were easier and faster to install and we all know “time is money”. 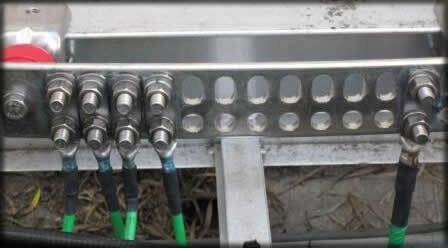 By not having to space the lugs, we were able to utilize all the holes, making buss bar installations clean. I’m convinced that these washers will change our way of thinking on ground bars. Give Bondwasher® a try. You’ll be amazed! 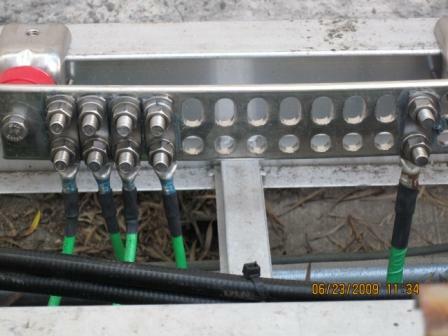 Jack Kim, V.P Operations, Transceiver Communications, Inc.
Great looking clean ground bar sets in these pics you sent! We love to see and hear about the great feedback you are getting from the carriers and installers. It's been a pleasure doing business with Transceiver Communications, Inc. these last many years. I believe you run a top notch company that cares with attention to detail and it certainly shows in these photos. If you have a testimonial and or pictures like the ones from TCI please send them to tim@bondwasher.com.